Time for a picture of My Preserved Wedding Dress. Hope you like it. 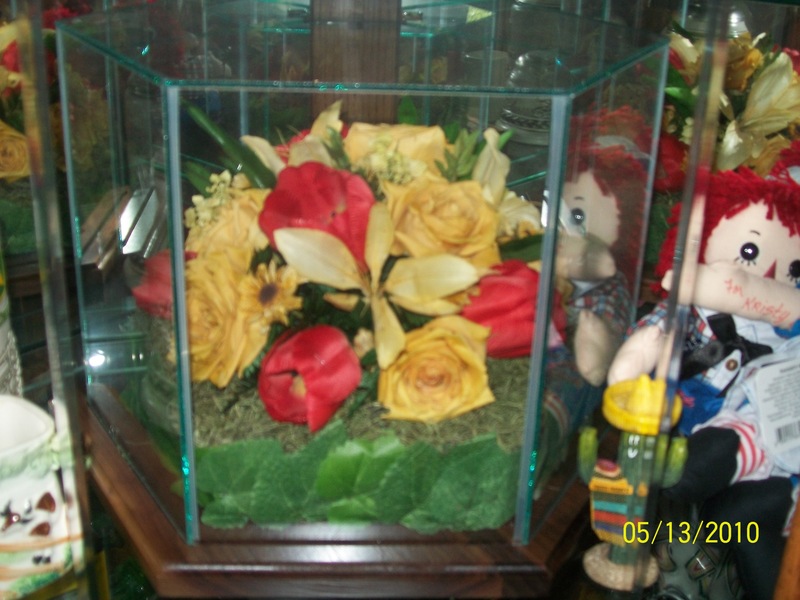 Also it is about time to post a picture of My Preserved Bouquet. Hope you like this one too. This past Friday night Darrell and me went and picked up my preserved bouquet!!! It looks amazing! It really looks the same as it did in September, over 6 months ago!!!! Of course the stems are gone and it’s been put in a glass container, but we both love it! It is now in our curio cabinet and I will try to get a picture of it on here (along w/ the picture of my dress that I promised!) I can’t wait for everyone to see it!! Last week we FINALLY got our wedding DVD’s. An edited and an unedited copy. It was very exciting to watch the wedding all over again. If anyone is interested, let me know! However, we are having troubles with the guy who did them. We are supposed to get 4 more copies of the edited version, and I let him know something was wrong with the sound on one of the DVD’s of the unedited version, so far he hasn’t responded. I’m very frustrated! Anyways, there are other problems, but there is nothing we can do about it now……. A couple weeks ago, I finally got my new voting card in the mail! I am now officially able to vote in Kendall County under my new name!!! Yay! As you can see a copy of our 1st Christmas together Christmas card has been put on our webpage! Thanks dad!! ENJOY!! 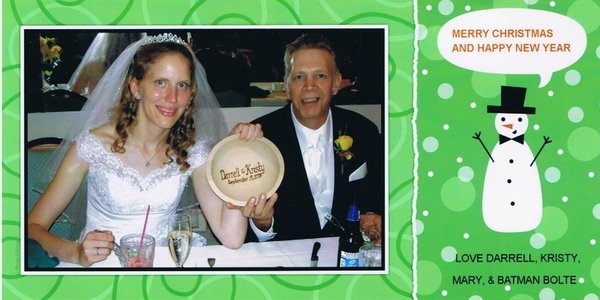 Kristy Langstraat (’05), daughter of Randall & Kathy (Advising Office) Langstraat, was married on September 19, 2008 at the Gaslite Chapel & Manor in Aurora to Darrell Bolte. Brother of the Bride, Randy Langstraat (’05) was one of the groomsmen. The couple resides in Montgomery, IL. I have 2 copies of the paper to save forever!! I know it’s been awhile since I’ve written a post on here, so I just wanted to let everyone know that I got my new passport in the mail last week, AND I got my old one back, which I’m really happy about, because I didn’t want to lose my stamps from the countries I’ve already been to!!! This past weekend and week my dad helped me change my name and address on all of my credit cards! Yay! Thanks dad! I am getting my wedding dress, my wedding shoes and my veil preserved. We have decided to go with the museum method. I can’t wait. My parents came over on Sunday and my dad helped us get my dress in this tiny box they sent and then on Monday I had to bring the box to a UPS store. I can’t wait to get it back, but it is going to take so many months, not even really sure how long! Museum method is what Darrell and me chose to do because neither one of us wanted me to have this beautiful dress that was worn only once and then stuffed into a box! 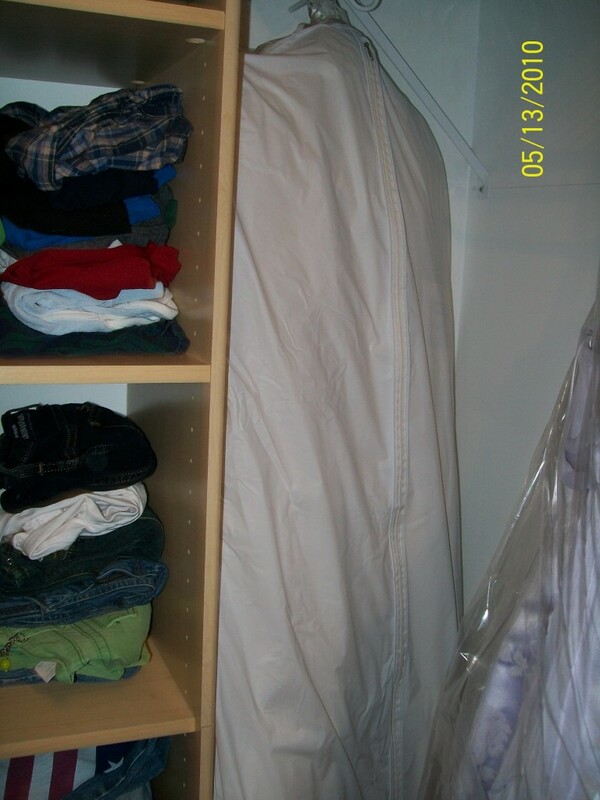 With the museum method it is preserved just like clothing would be preserved for a museum display. It will be in a bag and comes with special gloves so that you can always open the bag, look at the dress, show others, and it will never ruin! It is so exciting!! Maybe once it does come back I can get a picture of it up on here!!! There is the link on the side of this website to go visit our Daily Herald newspaper announcement. It was in the papers this past Sunday, so in case you missed it you can check it out here, it is really nice! Let me know what you think! Also, when you are there make sure that you visit the different tabs at the top, like to the profile, sign the guestbook, and the other tabs as well!!! We hope you enjoy it!!! We sure did!!!! YAY!!!! The wedding photos are finally online!!! There is a link to the side w/ the password, but just so it’s on here you just need to go to www.photographybystanley.com and click on the picture of Darrell and me and then put in the password B2449. Make sure the B is capital and enjoy!! Leave me comments here and let me know how you like them!!!!! Yesterday in the mail Darrell and I received our new tractor checkbook cover! It is so cute! Can’t wait to have the checks that will go in it!!! I went to the DMV yesterday and I finally got my name and address changed on my license, so that was fun! Not really, it took forever! But what else would you expect at the DMV right?! Then while I was there I was able to register to vote in Kendall County! Yay! Now I just have to pursuade Darrell to register to vote! Don’t know if that will happen though! want to see the proof book. Please leave me your comments! at the top of any message.